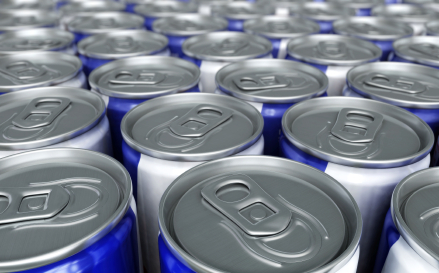 Reviewing data gleaned from a meta-search of the medical literature via PubMed (an online data base of medical journals) and print and trade media via Google, researchers at the University of Miami conclude that energy drinks have no therapeutic benefit to children, and both the known and unknown properties of the ingredients, combined with reports of toxicity, may put some children at risk for adverse health events. Half of market consists of children under 12, adolescents (12 - 18 years old) and young adults (19-25 years old). Typically, energy drinks contain high levels of stimulants such as caffeine, taurine, and guarana, sugars and sweeteners, herbal supplements and other ingredients. Energy drinks are distinct from sports drinks and vitamins. Energy drinks are not recommended for rehydration. Many energy drinks not only contain 70 to 80 mg caffeine per 8-oz serving, three times the concentration in cola drinks. Caffeine content may be nearly 5 times greater than in 8 oz of cola drinks when packaged as "energy shots" or as 16-oz drinks. The actual amount of caffeine dose in a single energy drink may be much higher than listed because they often contain additional amounts of caffeine in the form of additives, including guarana, kola nut, yerba mate, and cocoa. Each gram of guarana can contain 40 to 80 mg. of caffeine, which may stay in the body for a longer period of time because of interactions with other plan compounds. Safe consumption levels have not been established for most adolescents. Among 10- to 13-year-olds, 31% of girls and 50% of boys have tried energy drinks; 5% of girls and 23% of boys reported drinking them regularly but at a rate of less than 1 can per week. Germany has tracked since 2002; reports liver damage, kidney failure, respiratory disorders, agitation, seizures, psychotic conditions, rhabdomyolysis, tachycardia, cardiac dysrhythmias, hypertension, heart failure, and death. Youth-aimed marketing and risk-taking adolescent developmental tendencies combine to increase overdose potential. Experts recommend that adolescent and child consumption of caffeine not exceed 100 mg/day and 2.5 mg/kg per day. Effects of caffeine consumption by children remains unclear; heart rate significantly lowered in boys in one study compared to men; boys also exhibited increased motor activity and speech rates and decreased reaction times than men. Caffeine may affect future food and beverage preferences in children by acting on the developing child's brain reward-and-addiction center, an effect which may be more pronounced in boys than girls, with one study of 12- to 17-year-olds revealing that boys found caffeinated soda more reinforcing than did girls regardless of usual caffeine consumption. High doses of caffeine may exacerbate cardiac conditions for which stimulants are contraindicated, with the effect on ion channelopathies and hypertrophic cardiomyopathy, the most prevalent genetic cardiomyopathy in children and young adults, of particular concern because of the increased risk of hypertension, syncope (fainting), arrhythmias (irregular heartbeat/palpatations), and sudden cardiac death. Children and adolescents with eating disorders, especially anorexia nervosa, may regularly consume high amounts of caffeine to counter caloric-restriction-associated fatigue, suppress appetite, and produce looser stools and some diuresis. The risk of cardiac dysrhythmias and intracardiac conduction abnormalities from high-caffeine energy drinks in children with eating disorders are "disconcerting." Caloric increases from energy-drink consumption may increase blood pressure, blood glucose levels, BMI, calcium deficiency, dental problems, depression, and low self-esteem in children; sugar and caffeine may also work in tandem to increase hyperglycemia, which is of concern to children with diabetes. Caffeine interfers with intestinal calcium absorption, which is especially important during the growth spurt in early adolescence, although whether it is caffeine itself or replacement of milk intake by caffeinated beverages is the leading contributor to lower bone acquisition during adolescence. High consumption is suggested by self-reported surveys but is underdocumented in children, although deleterious associations with energy-drink consumption have been reported globally in case reports and popular media. Interactions between compounds, additive and dose-independent effects, long-term consequences, and dangers associated with risky behavior in children remain to be determined. mood and behavioral disorders (e.g. ADHD). The FDA limits soda to 71 mg of caffeine per 12 ounce can because soft drinks are classified as food. Energy drinks are unregulated by FDA because they are claimed to be "natural dietary supplements." US Senate considering bill to require supplement manufacturers to register annually with FDA and allow recall of those suspected of being unsafe; ingredients may also be restricted to those already approved by FDA. The study makes both short-term and long-term recommendations. Inclusion of questions about the use of energy drinks in the taking of diet and substance-use histories during routine well-visits and pre-participation physical evaluations (note: the fourth edition of the Preparticipation Physical Evaluation monograph will feature a revamped health questionnaire focused on cardiac health problems that may be exacerbated by physical activity, adding questions about stimulant use, including energy-drink consumption). Counseling of children with pre-existing cardiac conditions about the risk of caffeine-containing products, including irregular heart rhythms, syncope, dysrhythmias, and sudden death. In the absence of research establishing energy-drink safety in children and adolescents, regulation, as with tobacco, alcohol, and prescription medications. 1. Seifer S, Schaechter J, Hershorin E, Lipshultz S. Health Effects of Energy Drinks on Children, Adolescents, and Young Adults. Pediatrics 2011;127(3):511-528.